If you’re in the market to make a change to your ATS, or add a new ATS in 2019, I’d like to invite you to a 20 minute executive overview of iRecruit, applicant tracking and onboarding technology at its best. 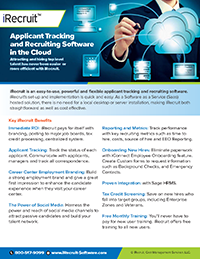 Robust applicant tracking software with unlimited job posting. Integration with major job boards like Indeed.com and Monster.com. Additional job distribution on ZipRecruiter.com. Track candidates through a custom workflow and built-in reporting. Onboarding new hires electronically with all new hire paperwork, including I-9s, W-4s, State Tax Withholding done online. iRecruit also offers WOTC tax credit screening and HR system integration. This entry was posted in Blog, iRecruit Blog and tagged applicant tracking, ats, iRecruit, onboarding, recruiting. Bookmark the permalink.